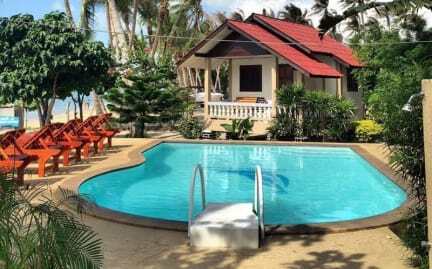 Charung Bungalows is located on the sunset side of Haad Rin. The resort is within a walking distance to the full moon beach. We are surrounded by many restaurants, bars and spas. Charung is located on a quiet spot where the nightlife doesn't disturb you. Charung is the perfect place to stay if you like to be near from the action and nightlife, but you still enjoy peace and relaxed ambience in your resort! Charung Bungalows has a shop. bike rental, travel agent and laundry services. Charung Bungalows has many kind of different rooms for solo and group travelers. There is many different room types from the economy small fan bungalow to the seaview Deluxe room. Mini Bungalow: fan, double bed, cold ensuite. Fan Room: Fan room with double bed, cold ensuite. Triple Air Con: Air con,a double bed,a single bed, hot ensuite. Triple sea view: Air-condition, double bed, single bed and hot ensuite. Double Garden View: Air-condition, double bed, hot ensuite. Family room: Air-condition, 2 double beds and hot ensuite. Deluxe Triple Seaview:Air-condition, double bed, single bed and hot ensuite. - Pre-payment 50% of the balance due. - No pre-payment = no confirmed booking . - Cancel 21 days before planned arrival and you will be refunded your money - no refund if late cancellation. Only two Sockets in the room very high with no table so impossible to charge your phone because it would hang there and just fall out, room was very dark and had very bad light so could only open the door for some light but was really warm. Booked a fan room so didn’t have aircon, when I decided I did want to have aircon I had to pay extra 1700 baht. Way to overpriced, pool is great and beautiful view you can see Koh Samui from the pool.